I thought I'd catch-up with you all and show you what I've been rocking on a night out recently! I'm usually more of a Dress or skirt lady when it comes to dressing up for a night out, but I decided to go for a smart-casual look for my besties 21st. I basically had no idea what to wear, so after hours of trawling round the shops, in true 'Rachael style' I ended up going for clothes I already had at home - typical! 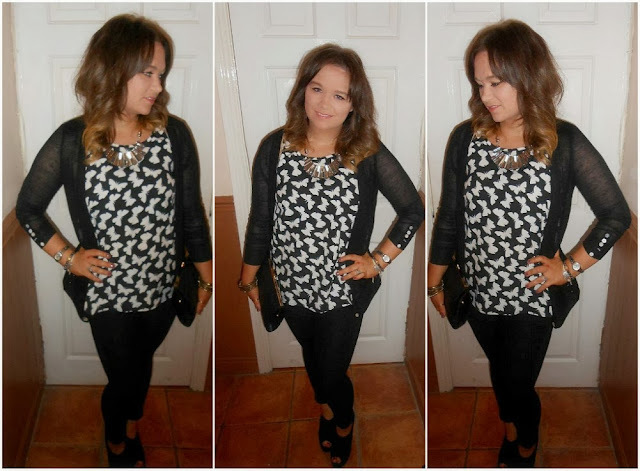 This is just a wee #OOTN I put together. The trousers were a brill Topshop buy. I turned up the bottoms - partially because I'm short, and I quite like the turned up trousers look. The top was quite the impulse buy when I was in Glasgow for another friends 21st and realised I'd forgotten my 'going out' outfit (I'd forget my head if it wasn't attached) and I thought it looked chic, expensive, but truthfully cost me the whole of £5! I thought the outfit needed a statement piece necklace so I picked up this tin-whistle looking necklace from Topshop for £15 (with 20% off) and added another Primark piece in the form of the stylish yet affordable clutch. I know, I have so many bag's, but it was £4 so I couldn't say no, and it fit's sooooooo much in! So, what do you all think of my smart-casual look for a night out? I also used this look, minus cardi and plus blazer for for a job interview and got the job - so it's a versatile look - which is always my favey! What's your take on 'Smart Casual'?